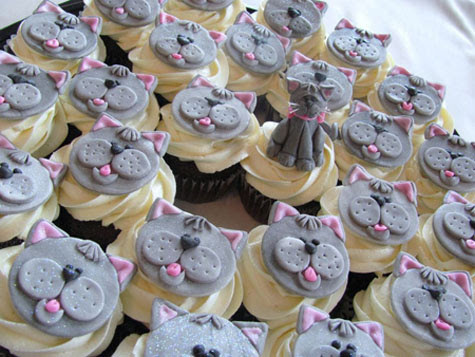 Missy Hewitt-Grable of A Little Something Sweet knows that gray kitties make for adorably delicious cupcake toppers! Missy, whose Waynesboro, VA-based boutique bakery is dedicated to the memory of her grandmother, created this feline-friendly design, complete with a dash of edible glitter! Feline Yogi Yoga Cat Mat Giveaway Winner! Xenotees Cat Nap Pillowcase Set Giveaway! Win A Yoga Cat Mat From Feline Yogi! Simon's Cat In "Feed Me"